The shift from ‘expert’ to ‘amateur’ gatekeepers of cultural content in a web 2.0 context has been lamented by many an Internet skeptic as an ‘undermining of our culture’ (Keen 2007). However, gatekeeper studies have demonstrated that the process of ‘expert’ selection (or not) of media for publication or dissemination is subject to vagaries of personal subjectivity (David Manning White, 1950) or to bureaucratic routine (Walter Gieber, 1964). Negus points out that despite its ‘liberal’ image, the distribution of power within the cultural industries is quite regressive and that decision-making power is often situated within small enclaves of privilege—where the music industry actually represents ‘in condensed form, the preferences and judgements of a small, relatively elite educated, middle-class, white male faction’ (Negus, 2002: 512). Such examinations of gatekeeping practices have made an important contribution to understandings of power and influence within the cultural industries. However, they have yet to fully examine the manner in which certain technological and social developments have increased the role of non-professional gatekeepers (e.g. fan fiction communities, YouTube vloggers, bloggers or piracy forum moderators (Crisp, 2015; Bodó, B. and Lakatos, 2012)) as well as the intermediation provided by non-human filtering devices such as recommendation algorithms and search. Even we as media users play an important role here, actively feeding the filtering devices and computational processes set up by major technology platforms to facilitate media dissemination and consumption (Striphas 2015, Gillespie 2014). Indeed, in opposition to the claims that web 2.0 has been accompanied by a process of disintermediation (whereby intermediaries no longer play a role in mediating between audiences and producers), this symposium will examine the role of the complex and diverse ecosystem of formal and informal, visible and invisible, human and computational media gatekeepers, that is currently rising to the fore. 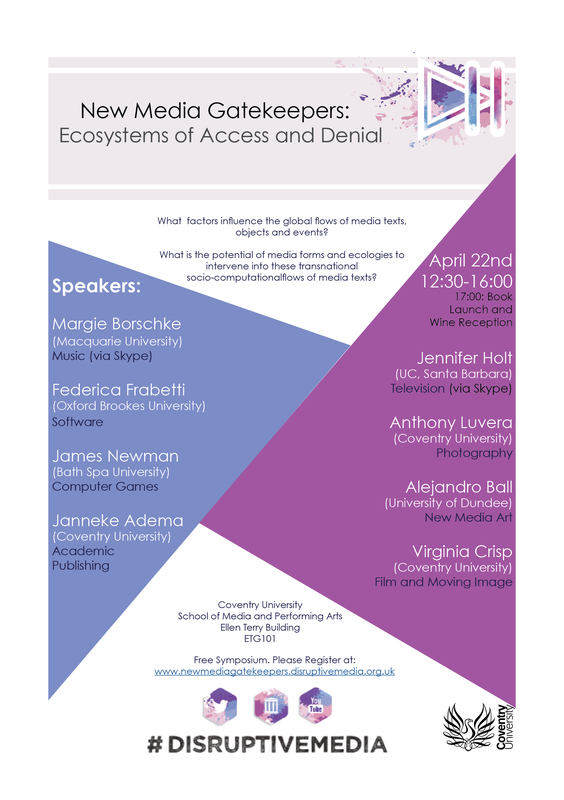 Keeping in mind the diversity and specificity of various media forms, this symposium seeks to examine how the varying networks of media dissemination come together on various platforms and as part of networks of interactions and relations. It is our contention that the practices of media gatekeeping must be examined in a way that acknowledges the current level of interrelation between media forms and their associated process of production, distribution and consumption. How does the distribution and dissemination ecology of one medium, e.g. film, intersect with the associated ecologies of production, distribution and consumption surrounding games, TV programmes, software, books, newspapers, new media art, music, and other media content? What is the potential of various media forms and ecologies to intervene into these transnational socio-computational flows of media texts? According to which criteria are decisions about what will be published made, and can we foreground alternative criteria? Curran, James. “Literary Editors, Social Networks and Cultural Tradition.” in Media Organisations in Society, edited by James Curran, 215 – 239. London: Hodder Arnold, 1999. Gieber, Walter. “News is what Newspapermen Make it.” in People, Society and Mass Communication, edited by David Manning White and L. A. Dexter, 173 – 192. New York: Free Press, 1964. Gillespie, T. (2014) ‘The Relevance of Algorithms’. in Media Technologies: Essays on Communication, Materiality, and Society. ed. by Boczkowski, P.J., Foot, K.A., and Gillespie, T. Cambridge, Massachusetts: MIT Press. Kember, S. and Zylinska, J. (2012) Life After New Media: Mediation as a Vital Process. MIT Press. Manning White, David. “The ‘Gatekeeper’: A Case Study in the Selection of News.” In News: A Reader, edited by Howard Tumber, 66 – 73. Oxford, Oxford University Press, 2000. Negus, Keith. “The Work of Cultural Intermediaries and the Enduring Distance Between Production and Consumption.” Cultural Studies 16, no. 4 (2002): 501 – 515.